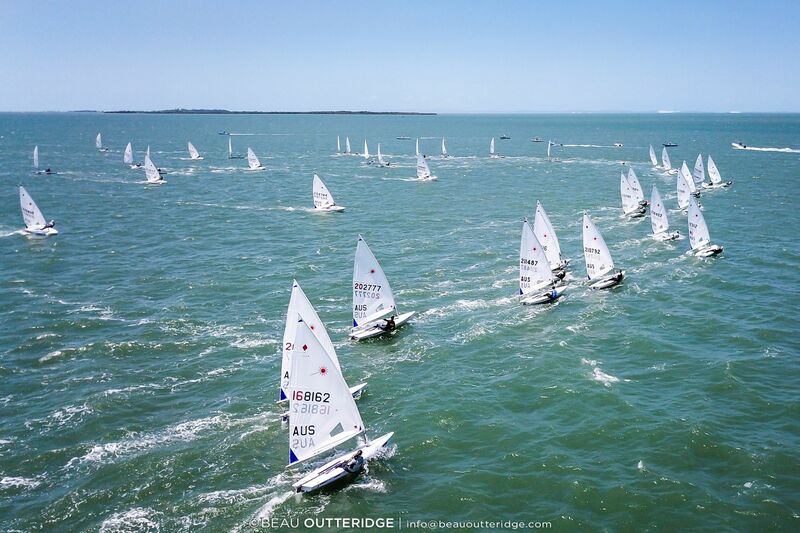 The Open Laser Championships for 2018 were held in Brisbane and hosted by the Royal Queensland Yacht Squadron. A total of 175 Lasers competed across 4.7, Radial and Standard rigs in breezes ranging from 6 knots up to 20 knots gusts on windward – leeward courses. The days were hot with mostly good afternoon sea breezes and occasionally the threat of an afternoon thunderstorm. Although sailing was cancelled on one day due to a lack of breeze, eleven of the scheduled twelve races were completed. This was the first time that the Oceania titles have been sailed and combined with the Australian Open championships. The regatta attracted 100 world championship points for the Women’s Radial and Men’s Standard divisions. This expansion was successful as nine countries were represented with 26 competitors from outside Australia. A highlight of the regatta was the performance of some of the younger members of the fleet with the 4.7 rig – overall and women’s being won by Junior (Under 16) and Youth (Under 18) sailors respectively, the Radial rig being won by a Youth (Under 19) and the more youthful Matt Wearn outpacing current Olympic Gold Medallist Tom Burton in the Standard rig. The Radials were the largest fleet with 75 boats competing. The Radial fleet raced as a single fleet and this resulted in highly competitive starts and numerous Black Flag starts to control the fleet. At the start of the last day only four points separated Zac Littlewood from WA and Josh Armit of New Zealand. Josh is the current World under 17 Laser Champion and was 4th in the Laser Radial Youth Worlds in Medemblik, Netherlands. Zac prevailed on the final day of three races in a steady 15-18 knot south easterly breeze to take the title. In third place was Yoshihiro Suzuki of Japan. Topping the Women’s division was Japans Manami Doi with Zoe Thomson second and taking the Australian championship. Third overall was Marlena Berzins. This year a Women’s Corinthian division was introduced and local Brisbane sailor Annie Eastgate in 13th place overall took away the inaugural title. The 4.7 fleet also enjoyed strong numbers with a 62 boat fleet battling it out. Perth’s Michael Compton sailed extremely well to win with a comfortable buffer. Second place went to Wonn Kye Lee from Singapore. Boston Curtis took third place. Kristen Wadley from north Queensland won the Women’s title, Sydney’s Sylvie Stannage was second and Singaporean Simone Chia third. In the Standard rig, the competition at the top was hot with Rio Olympic Gold Medallist Tom Burton duelling it out with last year’s Australian champion Matt Wearn. 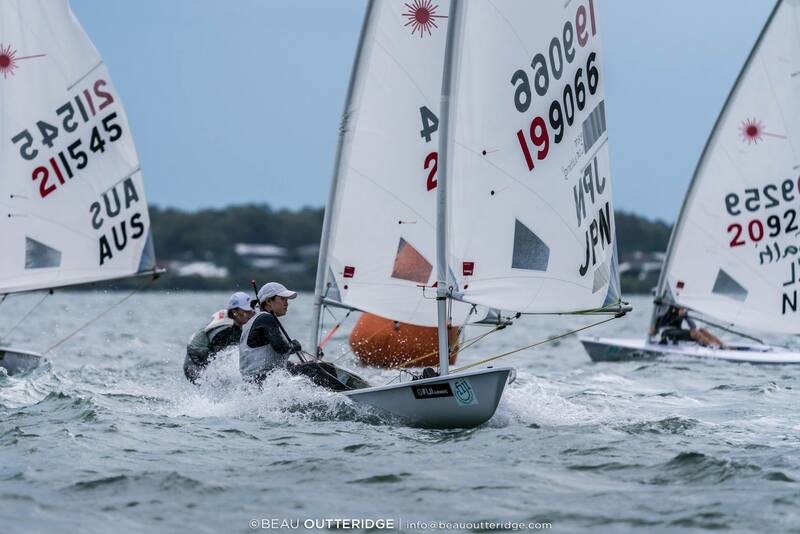 The conditions were clearly to Matt’s liking as he sailed an extremely consistent regatta to finish with a scorecard after drops consisting entirely of firsts and seconds. His worst race was a third. Tom Burton was as expected close on his heals finishing second and only three points behind win the same number of wins. Local Queenslander Mitch Kennedy was a clear third. 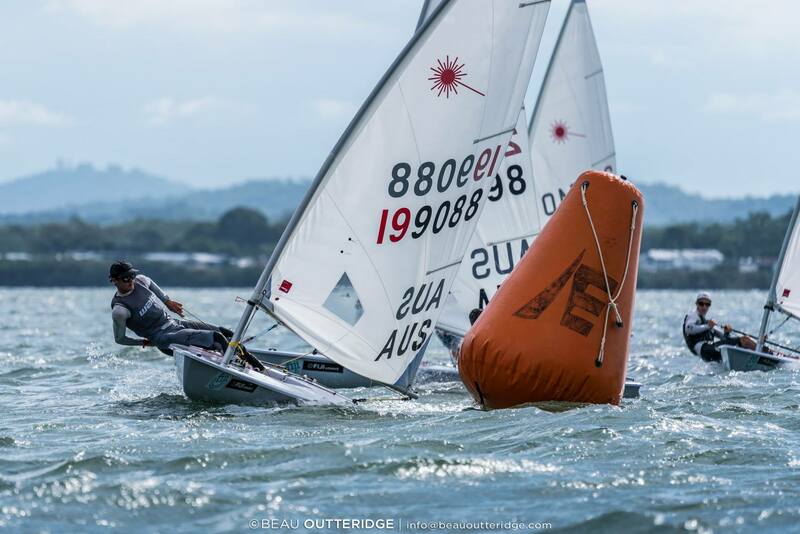 Abdullah Mohd Afendy from Malaysia was the highest placed international entrant with a very creditable 5th, in so doing, edging out the two remaining members of the Australian Sailing Team. Winner of the Under 21 division was Finn Alexander who defended his win from last year. Yuki Nishio from Japan in 19th place overall took away the inaugural Corinthian Men’s title. There is some great footage of the last two races from Rib and drone here. You can see the results for the 4.7′s and Standards HERE and the Radials HERE . The event web site is HERE. Next years Championships will be held at Devonport, Tasmania from 1st -8th Jan 2019.